"And they were each one quite odd..."
"There are those who contend that it does not benefit African­-Americans to get them into the University of Texas where they do not do well, as opposed to having them go to a less ­advanced school, a less ­­ a slower­ track school where they do well. One of, ­one of the briefs pointed out that most of the black scientists in this country don't come from schools like the University of Texas… They come from lesser schools where they do not feel that they're pushed ahead in classes that are too fast for them…I'm just not impressed by the fact that the University of Texas may have too fewer. Maybe it ought to have too fewer. And maybe some, you know, when you take more, the number of blacks, really competent blacks admitted to lesser schools, turns out to be less. I don't think it stands to reason that it's a good thing for the University of Texas to admit as many blacks as possible." Justice Antonin Scalia today, in oral arguments on Fischer v. University of Texas. All I have to say is, I heard arguments like this in my childhood, especially before the public schools I attended were integrated (which happened in 1970 16 years after Brown v. Board was handed down. When I got to Austin 8 years later, they were still fighting over it. And then there was the fight in Boston....). The argument against integration was that "the blacks" wouldn't like white schools, and wouldn't do well in them, and wouldn't be happy there, and were better off in "their own schools" with "their own teachers." It wouldn't, you see, be a good thing for the "white schools" to admit as many blacks as possible. And then, of course, we did. I never thought, in my entire life, I'd hear that blatantly racist argument uttered again, certainly not in the courtroom of the highest court of the land. I still think that John Roberts is the actual most dangerous racist in the United States, though the other four reliable votes to destroy the progress of the past hundred years are just as racist. It's got to be one of the greatest of ironies that one of the most racist of Supreme Court Justices of the past century is black, but that's Republican "justice" for you. It struck me that Scalia's "argument" here is precisely the reason affirmative action was, and still is, necessary. And Clarence Thomas sits silent. 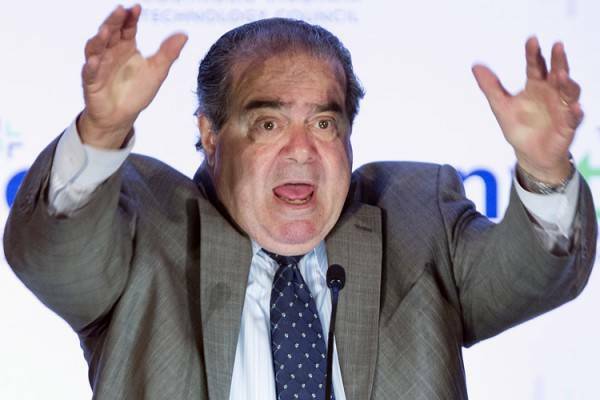 Scalia thinks Plessy is stare decisis.